Updating the classic '80s dive bar sound for the feminist future, sexed-up sleaze fully intact, with a switch flipped on the male gaze. 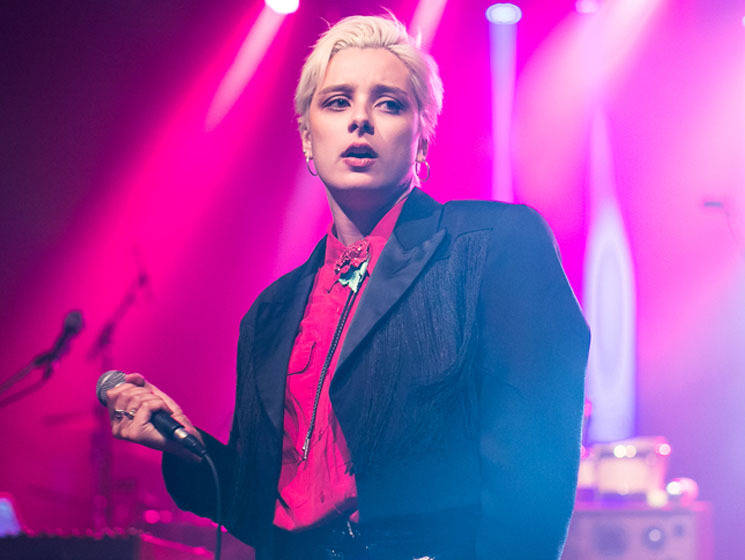 Toronto's Nyssa was in her natural element in mining town Sudbury, ON, stepping out from the stage to spend the majority of her set with the tight throng of listeners feeling it at the front of the room. Working through a set that sent the room back to working class teenage wastelands and distant summers past, paving the way with neon "Panama" synths, Nyssa only returned to the stage to cue up backing tracks on a laptop, digging into the grooves with dramatic gyrations and striking rock star poses as she prowled amongst her people, all while dispatching oil-slicked road narratives and the dreams of working class lovers like the stuff of vivid Springsteen vignettes, lines like "Start this story with a dead girl, that's what makes it just like the others" dismantling the structures from which they were born while reconfiguring the access points for a new generation.